This image shows the two brightest stars of the constellation Centaurus: α and β. α Centauri, also known as Rigil Kent or Toliman is the third brightest star in the night sky. The Alpha Centauri system is located 1.34 parsecs or 4.37 light years from the Sun, making it the closest star system to our Solar System. 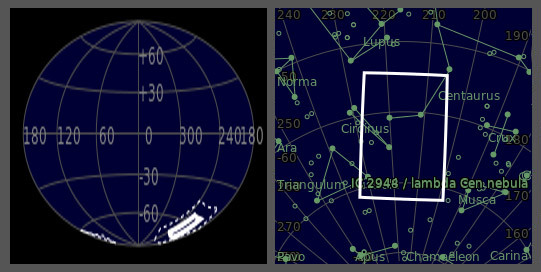 Although it appears to the unaided eye as a single object, Alpha Centauri is actually a binary star system (designated Alpha Centauri AB or α Cen AB) whose combined visual magnitude of −0.27 makes it the third brightest star (other than the Sun) seen from Earth after the −1.46 magnitude Sirius and the −0.72 magnitude Canopus. 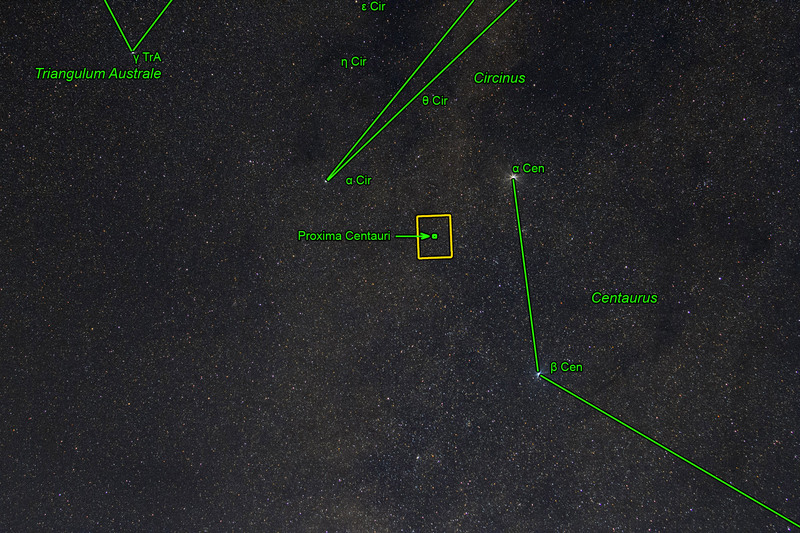 A third star, known as Proxima Centauri, Proxima, or Alpha Centauri C (α Cen C), is gravitationally associated with Alpha Centauri AB. 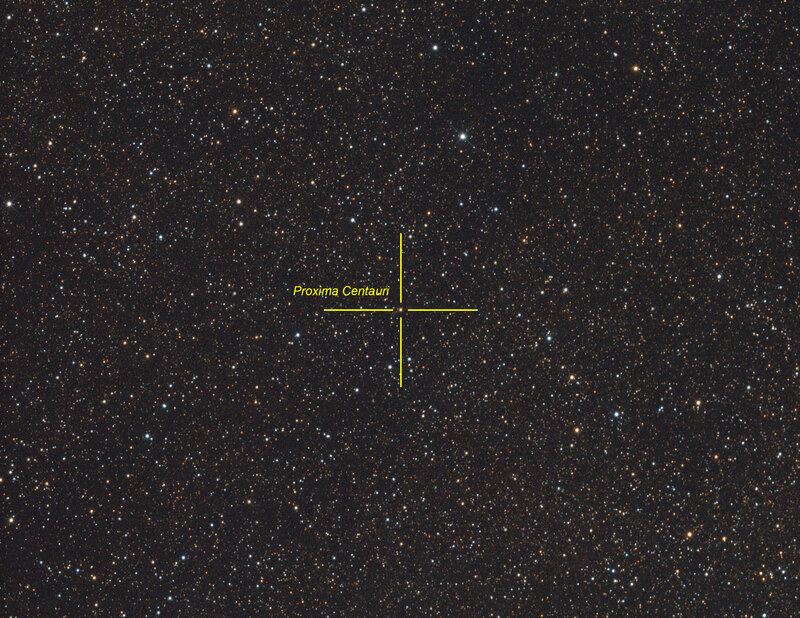 Proxima is at the slightly smaller distance of 1.29 parsecs or 4.24 light years from the Sun, making it the closest star to the Sun even though it is not visible to the naked eye. The separation of Proxima from Alpha Centauri AB is about 0.06 parsecs, 0.2 light years or 13,000 astronomical units (AU). This is equivalent to 400 times the size of Neptune's orbit. 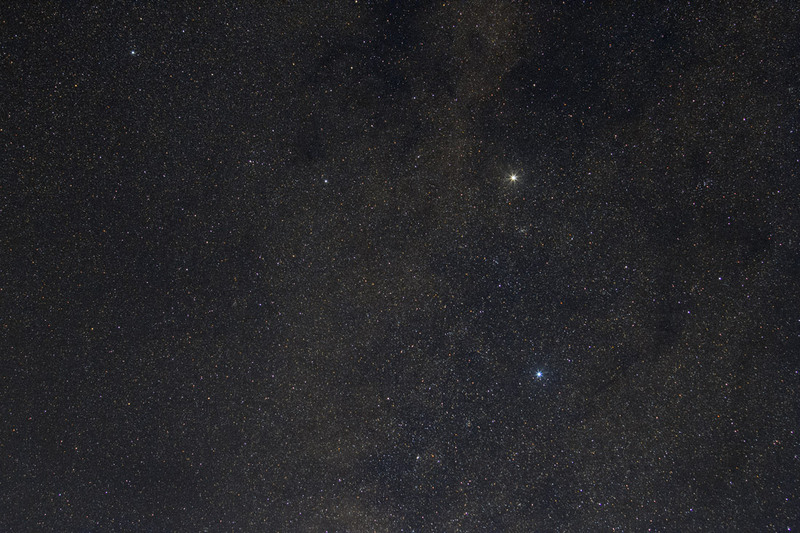 This image is almost centered on Proxima Centauri. Much more detailed image of Proxima can be seen here. The yellow rectangle on the reference map shows the dimensions of this image.